Asisbiz photo collection of ‘Grasses’. Poaceae or Gramineae is a family in the Class Liliopsida (the monocots) of the flowering plants. Plants of this family are usually called grasses, or, to distinguish them from other graminoids, true grasses; the shrub- or tree-like plants in this family are called bamboo (there are also herbaceous, non-woody bamboos). There are about 600 genera and some 9,000–10,000 or more species of grasses (Kew Index of World Grass Species). Plant communities dominated by Poaceae are called grasslands; it is estimated that grasslands comprise 20% of the vegetation cover of the earth. Grass species also occur in many other habitats that are not formally considered to be grasslands, including different types of wetlands (e.g., fens, marshes), forests and tundra. Poaceae is often considered to be the most important of all plant families to human economies: it includes the staple food grains and cereal crops grown around the world, lawn and forage grasses, and bamboo, which is widely used for construction throughout east Asia and sub-Saharan Africa. Civilization was founded largely on man's ability to domesticate cereal grass crops around the world. The term "grass" is also applied (incorrectly) to many grass-like plants that are not members of the Poaceae lineage, including the rushes (Juncaceae) and sedges (Cyperaceae). This broad and general use of the word ‘grass’ has lead to plants of the Poaceae often being called "true grasses". Poaceae have hollow stems called culms, which are plugged (solid) at intervals called nodes, the points along the culm at which leaves arise. Grass Leaves are alternate, distichous (in one plane) or rarely spiral, and parallel-veined. Each leaf is differentiated into a lower sheath which hugs the stem for a distance and a blade with margins usually entire. The leaf blades of many grasses are hardened with silica phytoliths, which helps discourage grazing animals. In some grasses (such as sword grass) this makes the edges of the grass blades sharp enough to cut human skin. A membranous appendage or fringe of hairs, called the ligule, lies at the junction between sheath and blade, preventing water or insects from penetrating into the sheath. 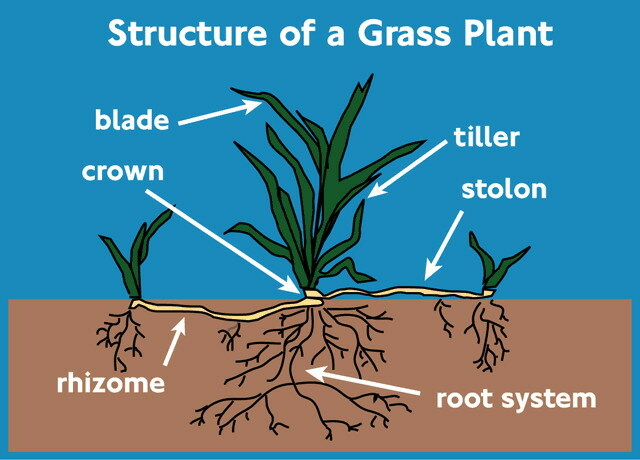 Grass blades grow at the base of the blade and not from elongated stem tips. This low growth point evolved in response to grazing animals and allows grasses to be grazed or mown regularly without severe damage to the plant. Flowers of Poaceae are characteristically arranged in spikelets, each spikelet having one or more florets (the spikelets are further grouped into panicles or spikes). A spikelet consists of two (or sometimes fewer) bracts at the base, called glumes, followed by one or more florets. A floret consists of the flower surrounded by two bracts called the lemma (the external one) and the palea (the internal). The flowers are usually hermaphroditic (maize, monoecious, is an exception) and pollination is always anemophilous. The perianth is reduced to two scales, called lodicules, that expand and contract to spread the lemma and palea; these are generally interpreted to be modified sepals. There are three general classifications of growth habit present in grasses; bunch-type (also called caespitose), stoloniferous, and rhizomatous. The success of the grasses lies in part in their morphology and growth processes, and in part in their physiological diversity. Most of the grasses divide into two physiological groups, using the C3 and C4 photosynthetic pathways for carbon fixation. The C4 grasses have a photosynthetic pathway linked to specialized Kranz leaf anatomy that particularly adapts them to hot climates and an atmosphere low in carbon dioxide. C3 grasses are referred to as "cool season grasses" while C4 plants are considered "warm season grasses". All grasses can be annual or perennial. * Perennial Warm Season - big bluestem, indiangrass, bermudagrass, switchgrass, and old world bluestems. Until recently grasses were thought to have evolved around 55 million years ago, based on fossil records. However, recent findings of 65-million-year-old phytoliths resembling grass phytoliths (including ancestors of rice and bamboo) in Cretaceous dinosaur coprolites, may place the diversification of grasses to an earlier date. * Puelioideae, a small lineage that includes the African genus Puelia. * Poa is a genus of about 500 species of grasses, native to the temperate regions of both hemispheres. Grasses are, in human terms, perhaps the most economically important plant family. Grasses' economic importance stems from several areas, including food production, industry, and lawns. Agricultural grasses grown for their edible seeds are called cereals. Three cereals– rice, wheat, and maize (corn)– provide more than half of all calories eaten by humans. Of all crops, 70% are grasses. Cereals constitute the major source of carbohydrate for humans and perhaps the major source of protein, and include rice in southern and eastern Asia, maize in Central and South America, and wheat and barley in Europe, northern Asia and the Americas. Sugarcane is the major source of sugar production. Many other grasses are grown for forage and fodder for animal food, particularly for sheep and cattle. Some other grasses are of major importance for foliage production, thereby indirectly providing more human calories. Grasses are used for construction. Scaffolding made from bamboo is able to withstand typhoon force winds that would break steel scaffolding. Larger bamboos and Arundo donax have stout culms that can be used in a manner similar to timber, and grass roots stabilize the sod of sod houses. Arundo is used to make reeds for woodwind instruments, and bamboo is used for innumerable implements. Grass fibre can be used for making paper, and for biofuel production. Phragmites australis (common reed) is important in water treatment, wetland habitat preservation and land reclamation in the Old World. Grasses are the primary plant used in lawns, which themselves derive from grazed grasslands in Europe. They are also provide an important means of erosion control (e.g., along roadsides), especially on sloping land. Although supplanted by artificial turf in some games, grasses are still an important covering of playing surfaces in many sports, including football, tennis, golf, cricket, and softball/baseball. With 10,025 known species, the Poaceae is the fourth largest plant family. Only Orchidaceae, Asteraceae, and Fabaceae have more species, although with over 10,000 species the Rubiaceae is not far behind. Biomes dominated by grasses are called grasslands. If only large contiguous chunks of grasslands are counted, these biomes cover 31% of the planet's land. Grasslands go by various names depending on location, including pampas, plains, steppes, or prairie. In addition to their use as forage worldwide by many grazing mammals such as cattle and other livestock, deer, and elephants, grasses are used as food plants by many species of butterflies and moths; see List of Lepidoptera that feed on grasses. The evolution of large grazing animals in the Cenozoic has contributed to the spread or grasses. Without large grazers, a clearcut of fire-destroyed area would soon be colonized by grasses and, if there is enough rain, tree seedlings. The tree seedlings would eventually produce shade, which kills most grasses. Large animals, however, trample the seedlings, killing the trees. Grasses persist because their lack of woody stems helps them to resist the damage of trampling. Grasses have long had significance in human society. They have been cultivated as a food source for domesticated animals for up to 10,000 years, and have been used to make paper since at least as early as 2400 B.C. Also, the primary ingredient of beer is usually barley or wheat, both grasses that have been used for this purpose for over 1000 years. * "The grass is always greener on the other side" suggests that an alternate state of affairs will always seem preferable to one's own. * "Don't let the grass grow under your feet" tells someone to get moving. * "A snake in the grass" means dangers that are hidden. * "When elephants fight, it is the grass who suffers" tells of bystanders caught in the crossfire.